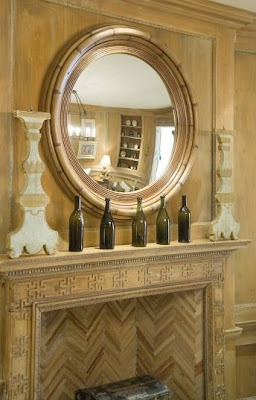 My mission, should I choose to accept it, is to design our fireplace mantel. My father-in-law is heading up from South Carolina to help us with our main level bath this weekend. Time allowing, he will also take a crack at building the mantel. Sooo...I haven't exaaactly designed a fireplace in the past. Ever. But, I know what I like, so that is always a good place to start. I know I want something simple, and white, but with a bit of flair...of the Chinoiserie variety. Now before you go thinking that I'm going to emblazon a dragon across my hearth, do keep in mind that I understand the term "resale". So, I'll try to keep the flair subdued since this IS a permanent structure that we are adding to the living room. So far, we've tackled paint, molding and furniture. Our poor little mantel doesn't give me a ton to work with, but it does have a white brick surround, which Carter and I both love. And we plan to paint the brick portion that extends onto the floor white as well - that will look dynamite against our dark-ish hardwood floors. I don't know the correct terms for parts of a fireplace/mantel. I want the "top part" to use the same crown molding that we use in the living room to offer some continuity to the space. Below the crown (I believe the area is called the "frieze)" comes the flair. I will once again thank John Loecke whose dining room profiled in Cottage Living* has been a little treasure-trove of information. 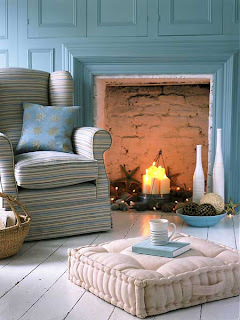 He used a trim on his chair rail that was just lovely - and the mag divulged that I could own that decorative trim through a company called Decorators Supply. After some deliberation, I have chosen this trim below to go across the front of the mantel. It is six inches tall, and thus will provide the chutzpah that I seek. Painted white, it will blend nicely with the rest of the mantel whilst keeping it interesting. The rest of the fireplace shall stay simple. 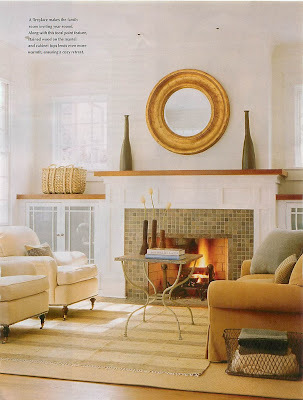 Simple white legs that will surround the white brick hearth. I might do a little more research to see if I can find a nice clean shape to show my father-in-law. I heart the room above on so many levels. I think I first saw it in Cottage Living. Oh dear, it's amazing. And I do enjoy the fireplace. 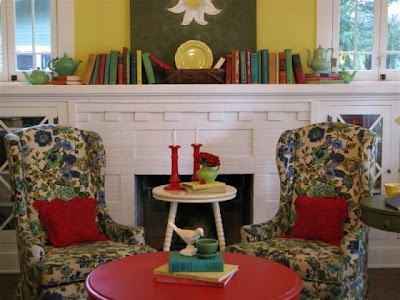 This image above shows my eventual vision of having low bookcases built on either side of the fireplace.